My tomatoes are out of control! Really, I’m not kidding. They’re taller than me and producing more fruit than I know what to do with. So here’s the start of recipes using tomatoes 🙂 For this recipe, I used both big beef and lemon drop yellow tomatoes – any type would work. Preheat oven to 350 degrees. 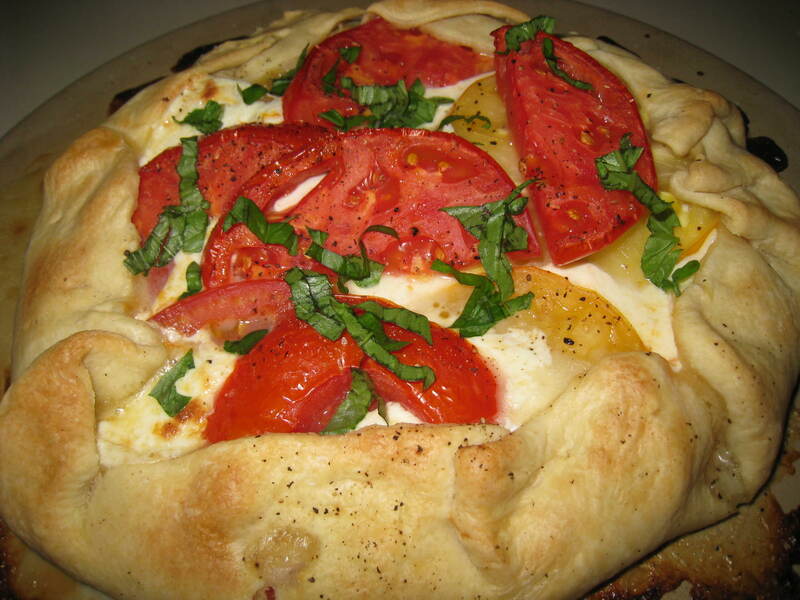 Using one pie crust leaving 1 to 1.5 inch margin at the edge, begin layering sliced tomatoes and cheese alternating until all tomato and mozzarella slices are used. Fold up the pie crust over top of the tomatoes and cheese. Pinch crust together in pleats to hold everything together. Brush with olive oil and season with salt and pepper. Bake for 15 minutes. Rotate pan and bake for an additional 15 minutes or until crust in nicely browned. Sprinkle with chopped basil and let cool slightly before cutting.